The American Legion Junior Shooting Sports Program is a gun safety education and marksmanship program that encompasses the basic elements of safety, education, enjoyment and competition. Shooters use the .177 caliber air rifle. Both males and females can participate, through Legion sponsorship; disabled youth are encouraged to join, as competitive shooting is a sport that creates an equal playing field for all competitors. Contact your local Legion post, Sons of The American Legion squadron or Auxiliary unit for information about affiliating as a club or individual. Junior Shooting Sports is a three-part program that combines the Basic Marksmanship Course, Qualification Awards and Air Rifle Competition into a well-rounded activity. Detailed information for teaching the course. Download from the JSSP Resources page, or by clicking here. Now in its third edition, a comprehensive reference text for beginners that thoroughly covers the fundamentals of position shooting. Download from the JSSP Resources page, or by clicking here. Six quizzes and a final exam. 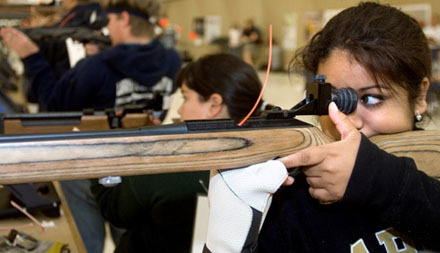 Graduates who want to keep improving their skills can enroll in air-rifle qualification courses provided by the National Rifle Association and the Civilian Marksmanship Programs. These courses offer personal skill-development ladders for shooters to achieve established performance standards. The annual 3-Position Junior Air Rifle National Championship is a tournament that begins with postal matches. State and/or regional champions are determined and advance to a qualification round (also a postal match) to determine the athletes who will earn expense-paid trips to compete in the national championship. The national championship is a shoulder-to-shoulder match held each July at the USA Shooting range facilities at the Olympic Training Center in Colorado Springs.